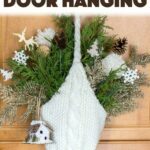 Winter Hat Door Hanging: make a statement on your front door this winter! 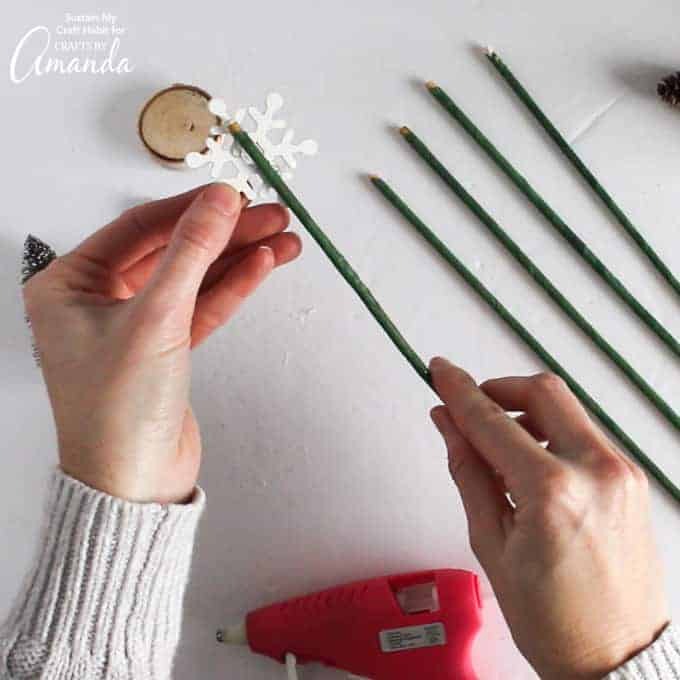 Sometimes the most beautiful DIY decor ideas can be put together with materials you have around your home. 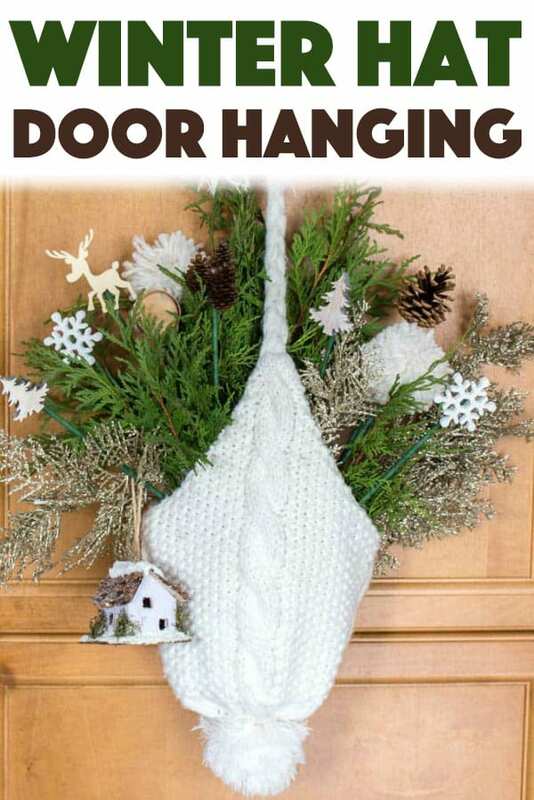 That was the case with this creative yet beautiful winter hat door hanging. I have four kids in my home and we have somehow accumulated boxes and bins of hats and unmatched gloves over the years. 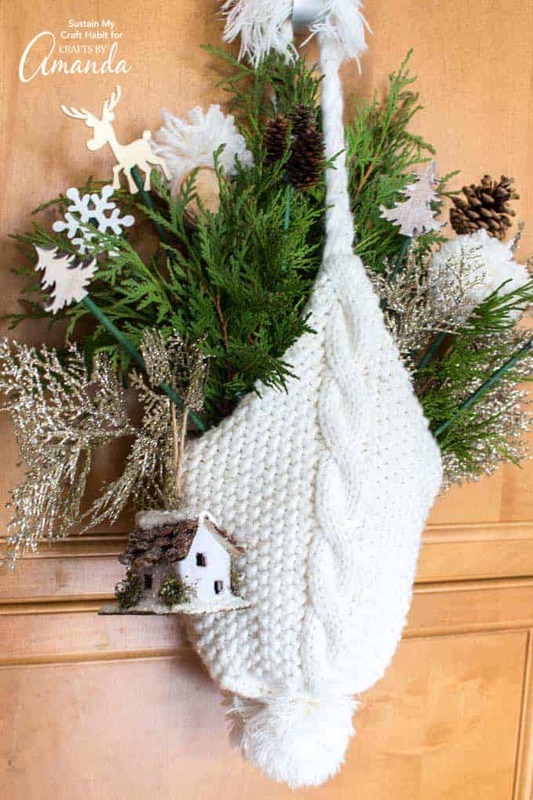 I recently saw this fun idea using winter mittens to create a decoration for the front door with. So I thought it would be fun to try to re-create this design, but using a lovely white knitted hat. I challenged myself to use only materials I had around my home. 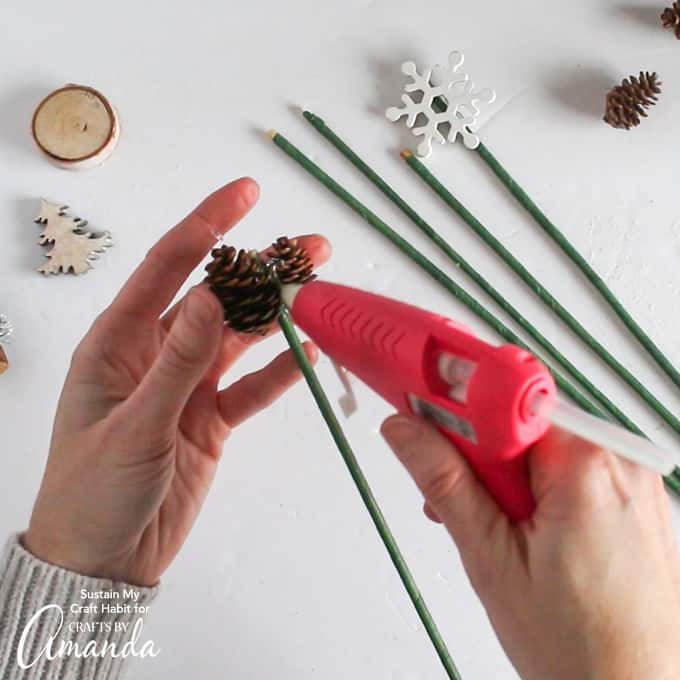 When I dug into my craft stash I was surprised to find a number of goodies including winter themed wood cut outs, glitter gold artificial sprigs, some pine cones, and an adorable birdhouse ornament. 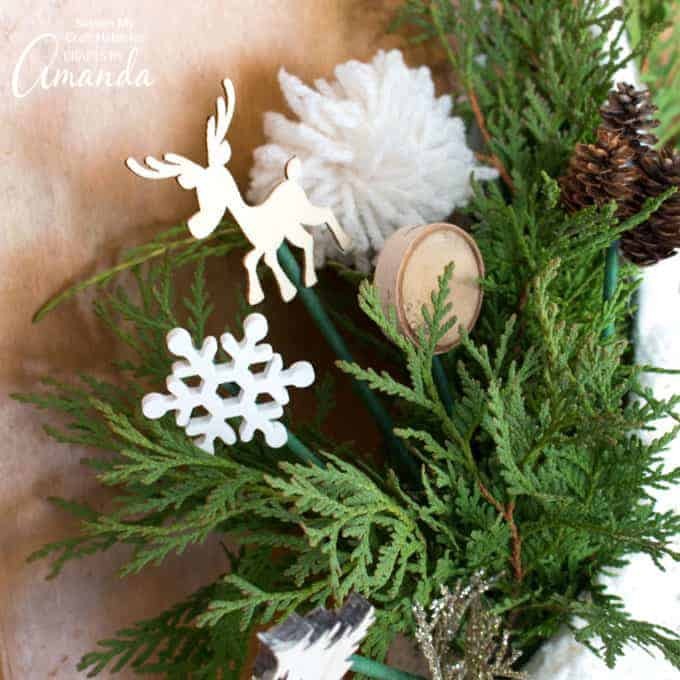 This all came together beautifully to create this Woodland inspired winter front door decor idea. I may also add some of our little sewn canvas Christmas ornaments or our simple sewn canvas Christmas ornaments. 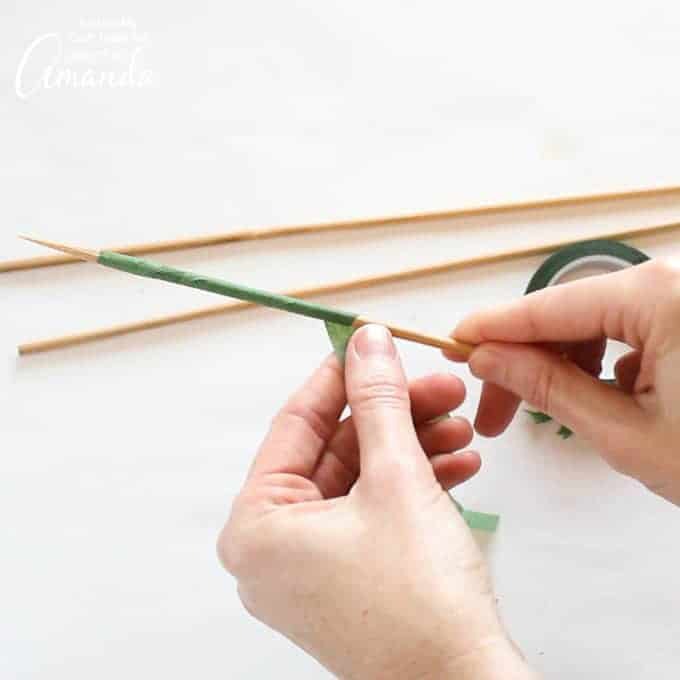 Begin by wrapping 6-8 bamboo skewers with green floral tape. 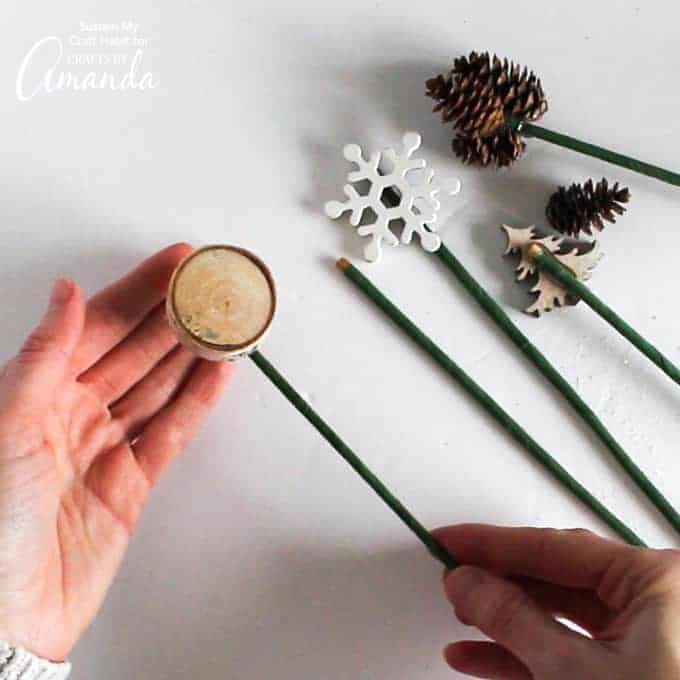 Glue various wood findings on to one end of each skewer including snowflakes, Christmas trees, pine cones, wood slices – whatever you have on hand. Set these embellishments aside. Although you could use artificial greenery and floral picks for this project I went outside to trim some greenery from my cedar bushes. 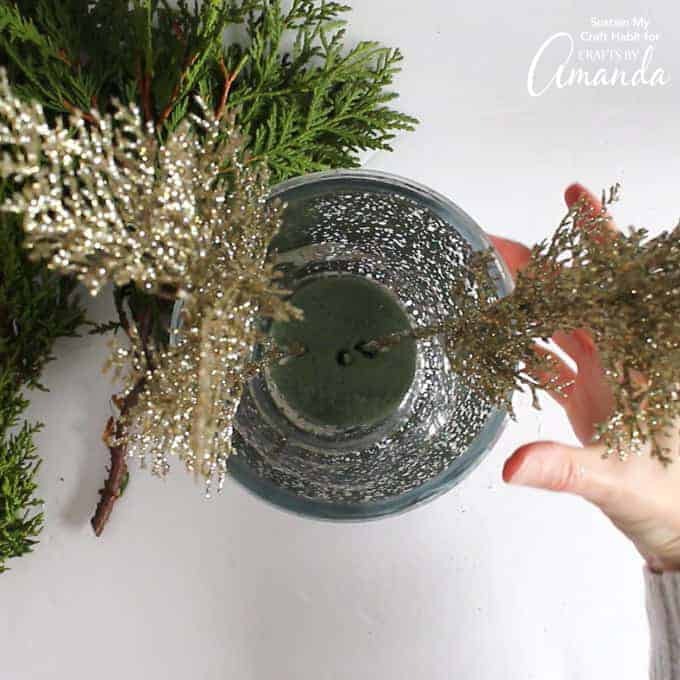 I also used some cuttings to make this simple rustic centerpiece as well as these simple adorable mini clay pot centerpieces. 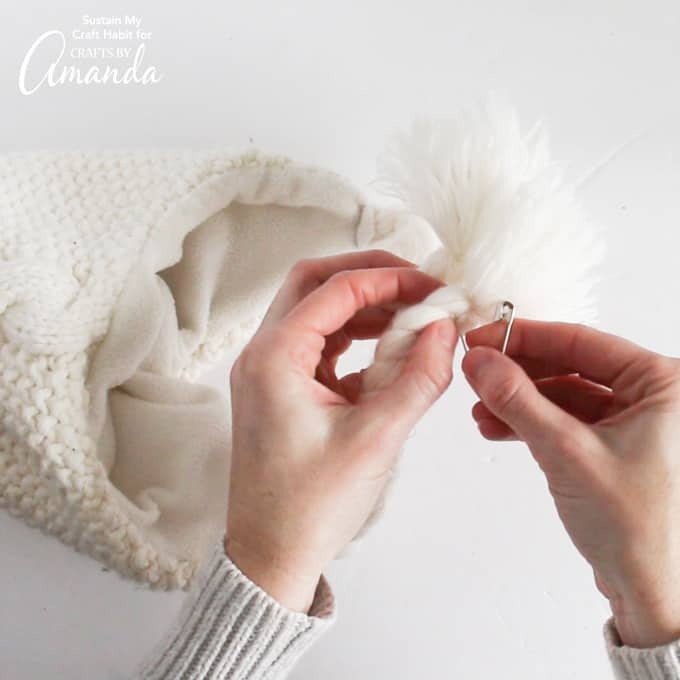 Secure the side of the hat together by using a strong clothespin and reinforce with an elastic band. This will become the hanging hook for your decor so be sure it is secure to hold all the weight. Alternatively, you could also stitch the ends of the hat ties together using a sewing machine. 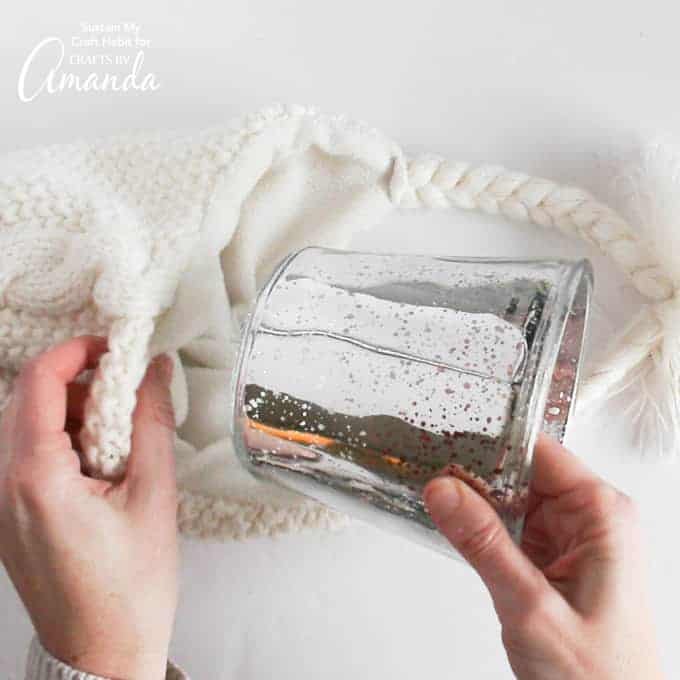 Find a wide glass or plastic container which will fit snugly inside the hat. 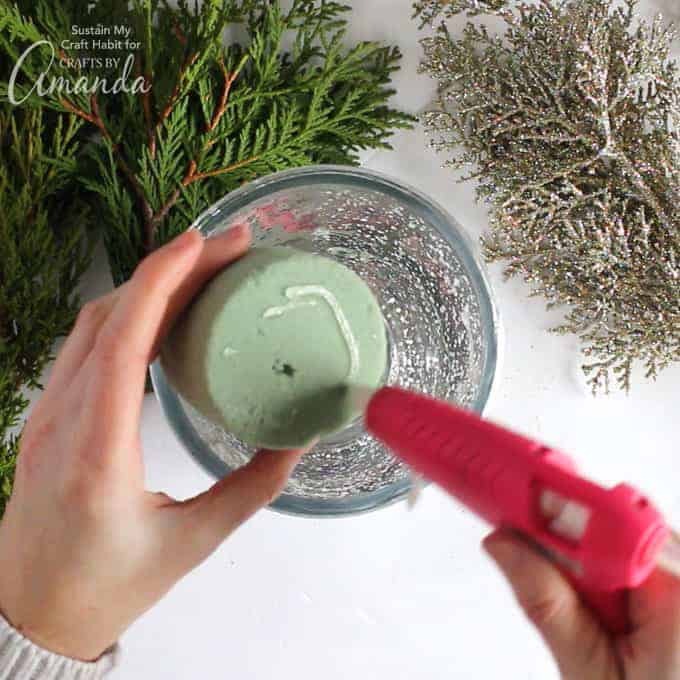 Glue some floral foam onto the bottom of the container to ensure that it stays in place. 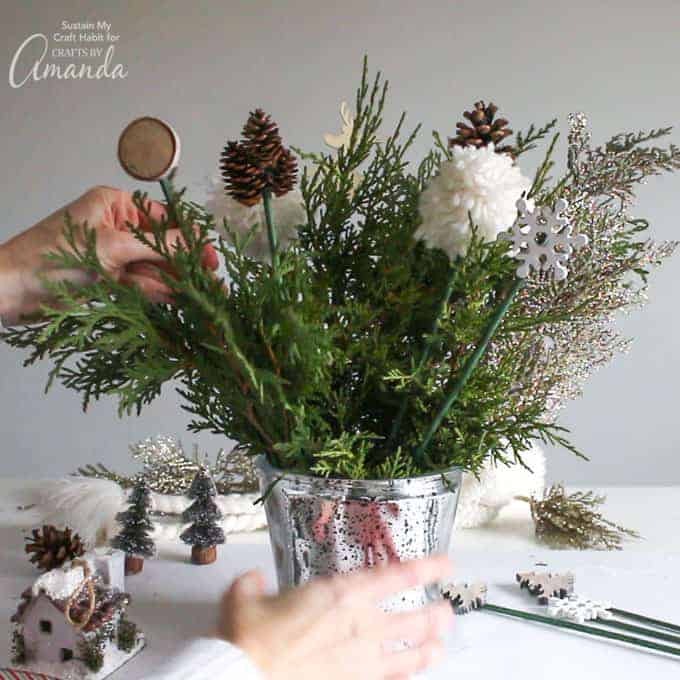 Starting with the larger bundles of greenery and sprigs, insert them into the container. Make sure your arrangement is balanced from one side to the other. Fill in the areas with all of the decorative pics. And then hang an ornament such as a small birdhouse to the outside of the arrangement. 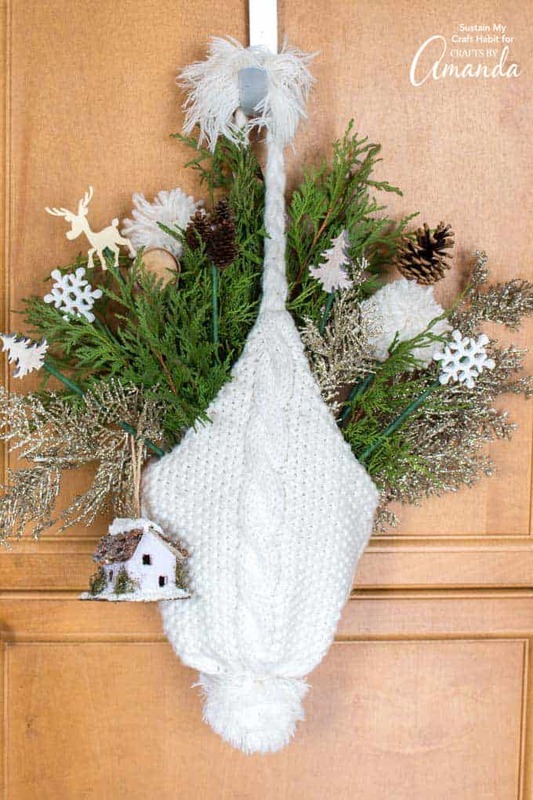 Place the arrangement back into the hat and hang on to your front door to enjoy. Since I used fresh greens, I added a little bit of water into the container to help them last longer. This step is not necessary if you use artificial greens or if you preferred just to switch out the natural greens once they dry out. And that’s it! I absolutely love my new front door decor. 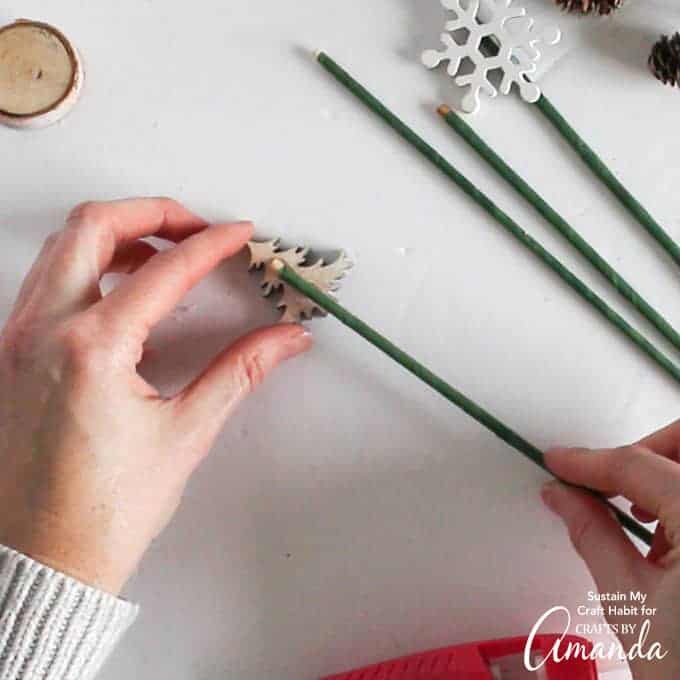 Not only is it lovely and festive for the Christmas season but sticking to a neutral color scheme means that it will look beautiful all through the winter. 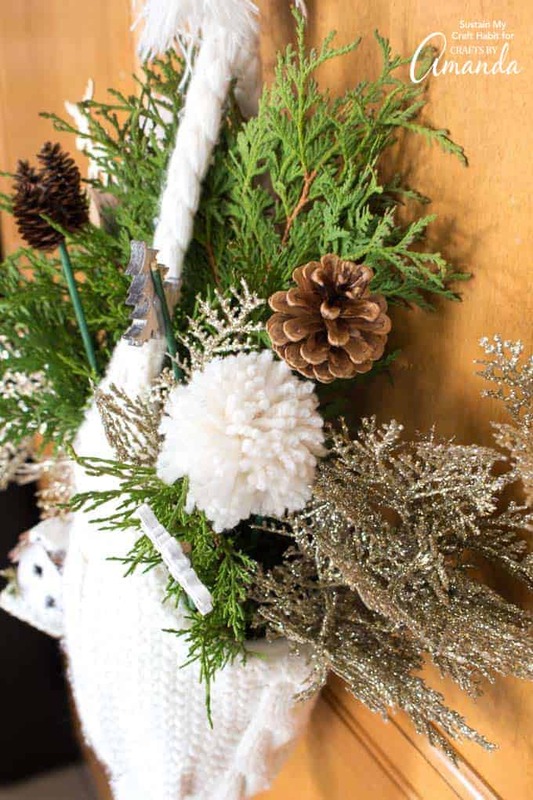 Create your own beautiful door hanging using foraged greens, decorative picks, and a cozy knitted Winter hat. 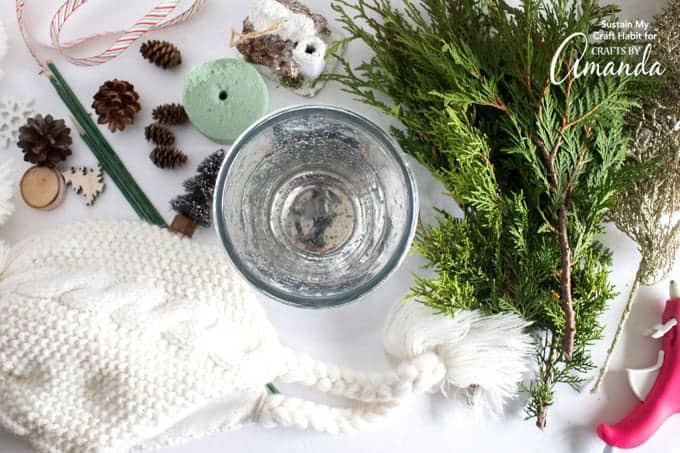 Gather the faux or fresh greenery and prepare the decorative picks. Glue floral foam in place inside container. Beginning with the largest greenery bundles, insert them into the container. Keep arrangement balanced on both sides. Add the prepared picks and any additional embellishments. Place arrangement inside the knitted hat. Secure hat ties together and hang finished arrangement.